The Nikon M-308 series riflescopes have become one of the most popular 308 scopes for visitors of 308AR.com seeking the best value for their hard earned money. I own two as well as a couple of the M-223 .223/5.56 AR15 versions. NIKON M 308 4-16x42mm BDC 800 RIFLESCOPE Nikon part number 16463 represents Nikon’s Precision AR Optic technology for heavier caliber rifles capable of long-range accuracy. A large magnification range combined with an oversize lens provides accurate shots with heavy caliber rifles in any conditions. NIKON M 308 4-16x42mm BDC 800 RIFLESCOPE was designed for extreme sighting speed and long range accuracy with 308AR, AR308 and Armalite AR-10 and similar rifles that utilize 308 WIN/7.62mm NATO round, the M-308 provides flagship Nikon optics and repeatable 800-yard precision. The M-308 line features Interchangeable Turret Technology for customized precision with virtually any load. To simplify field adjustments, Nikon has integrated Instant Zero-Reset Turrets into all new M-308 riflescopes. Just sight-on as usual, then lift the adjustment knob, rotate to your “Zero” and re-engage. Fully multicoated optics provide up to 95% light transmission for a bright, sharp sight picture in any shooting light between dawn and dusk. 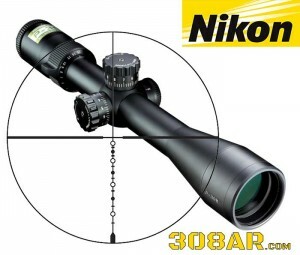 The NIKON BDC 800 RETICLE was developed specifically for the trajectory of the .308 Win/7.62 NATO Match round with 168gr. HPBT match bullet. The BDC 800 reticle is designed for a 100 yard zero on the crosshair – with points representing all ranges from 200 to 800 yards. Like all of Nikon’s riflescopes, the M-308 series is optimized for use with Nikon Spot On Ballistic Match Technology. Spot On allows you to discover all of the exact aiming points on your scope’s reticle at various yardages for your specific ammunition and load. Nikon riflescopes are covered by Nikon’s Lifetime Warranty. If any Nikon riflescope is found to have defects in workmanship or materials, we will, at our option, repair or replace it at no charge.